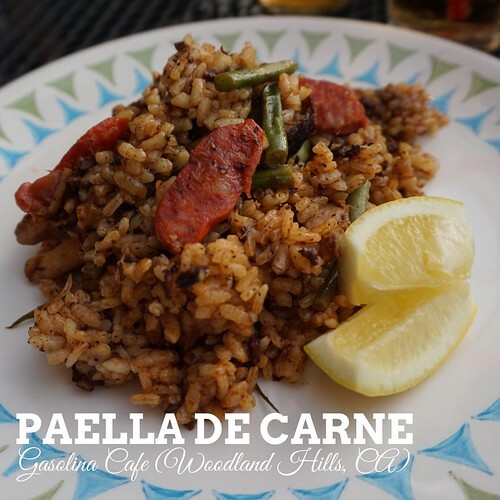 I’ve had Chef/Owner Sandra Cordero’s paella at my son’s 10th birthday party. When she mentioned she’s having another pop up for May I decided to invite a dear friend who also happened to be my son’s second grade teacher. It was a beautiful evening, not too hot nor cold out. Just perfect. 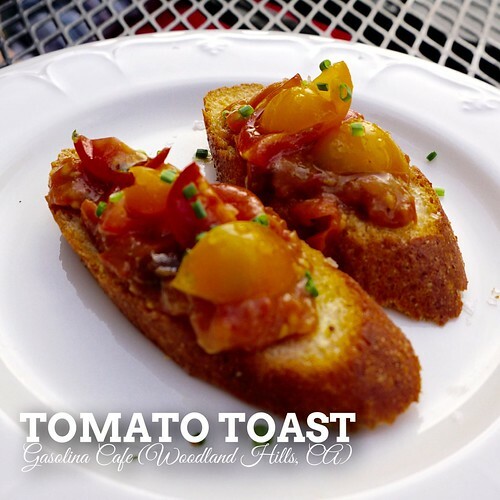 And we started with this toast beautifully topped with tomatoes. Perfect for a late spring evening. 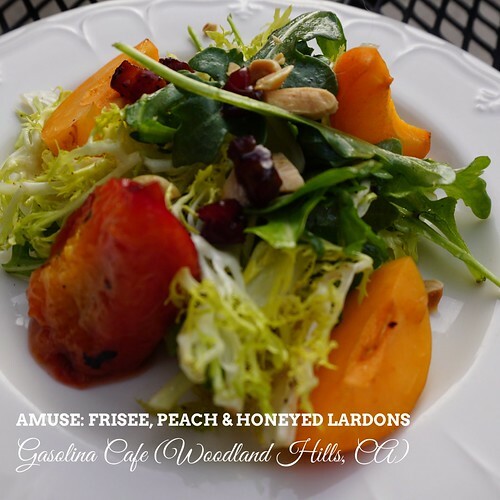 It was followed by an amuse of salad with frisee, peach and honeyed lardons. The sweetness from the peach and honeyed lardons balanced out by the bitterness of the frisee. 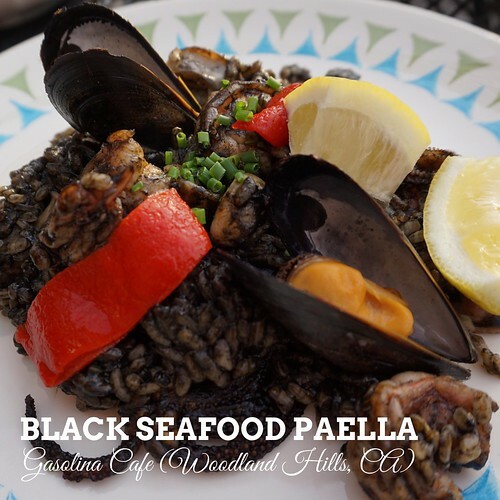 I personally had the Black Seafood Paella and it tasted exactly like Chef Sandra prepared it during my son’s birthday. I love squid ink myself so I enjoyed it very much. The rice is cooked with squid ink mixed with fish, shrimp, squid and clams topped with lemon. I think it’s a must to add lemon juice before eating as this rounds up the dish. I find it wonderfully light perfect for spring and summer. Everyone else in my group had the Paella de Carne. It’s a heartier, meat version. The taste makes you want to curl up your toes and relax. It’s my comfort food, Spanish style. 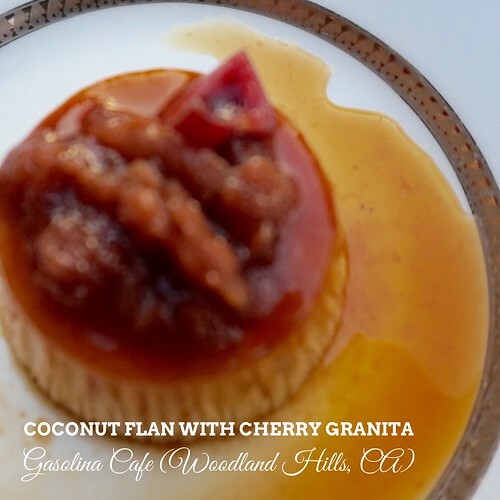 Our paella night ended with coconut flan. I had to apologize for the quality of this phone. When I reviewed it last night I honestly thought it was clear. It was perfect blend of tart and sweet. Chef Sandra’s paella will always be a winner in my book and I will always come back for more. 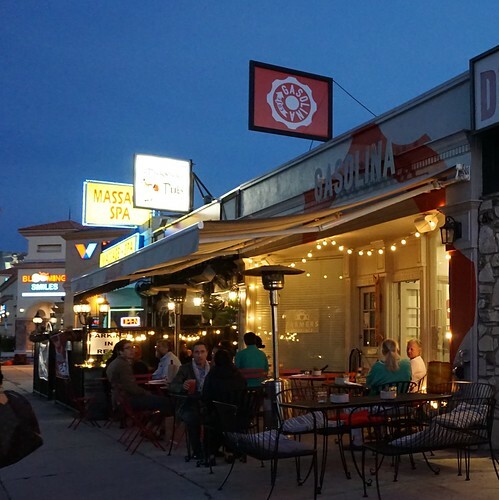 If you’re a big fan of Spanish food please visit Gasolina Cafe. 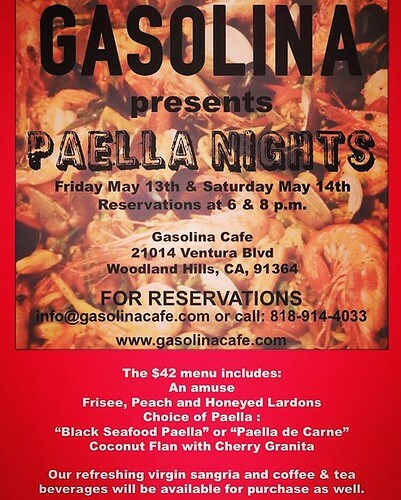 And if you haven’t had paella ever…well now’s the time to head out to the Valley. They are just off the 101 freeway De Soto exit.